ADHOC architects team is proud to present the recently completed project “La Géode”, carried out in cooperation with the young promoters of Knightsbridge. 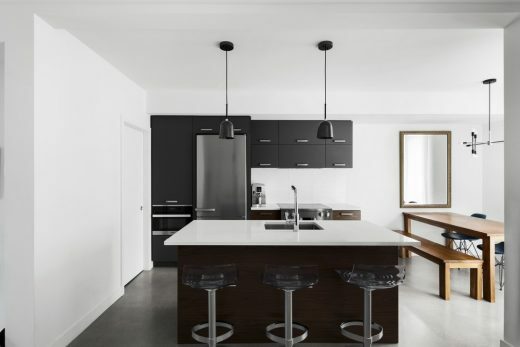 The project is located on “de la Roche” Street, in the neighbourhood of Le Plateau Mont-Royal, a vibrant district with an exceptional urban vitality. 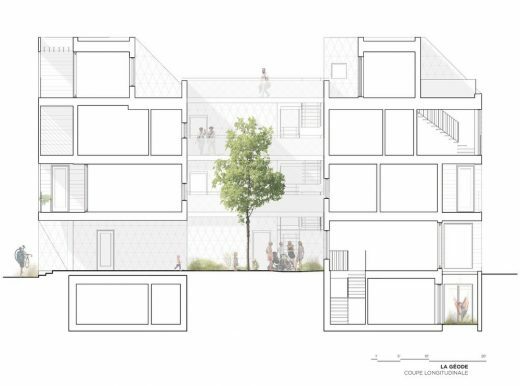 In the light of its situation, the project aims to give a new breath to its plot with a contemporary residential building of five housing units. It should intend to reflect all the energy of this strategic sector where young professionals mix with families and couples. Thus, the project has to be a soft densification that fits into the current urban landscape without distorting it. One of the concerns is to keep families in the city by creating a quality living environment based on a green strategy. 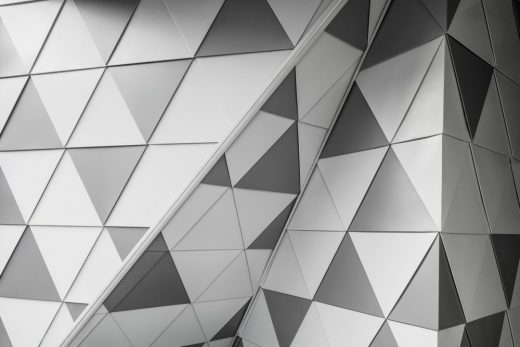 A narrative spin has nourished the inspiration of the project while supporting the architectural concept that valued an open central heart and a peripheral organization. This concept is inspired by the geode; a hollowed mineral mass which interior is covered by crystals. The geode, under an austere and protective external appearance, conceals a true crystalline treasure. It reveals a natural form of staging that stimulates inspiration around the notion of contrast. This concept is exploited through the project at different levels. 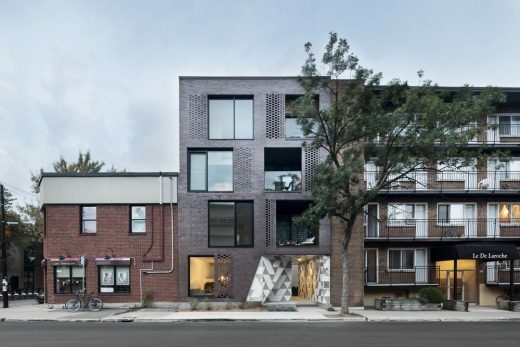 The exterior of the building is very sober, characterized by a modest materiality. 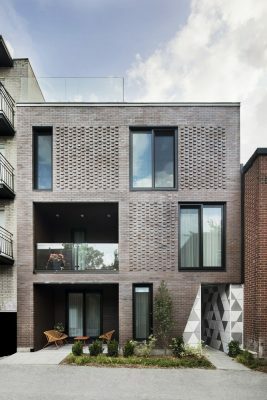 The headers in the brick layer and the openwork masonry in front of the windows and loggias reflect the mineral roughness and protective aspect of the geode. 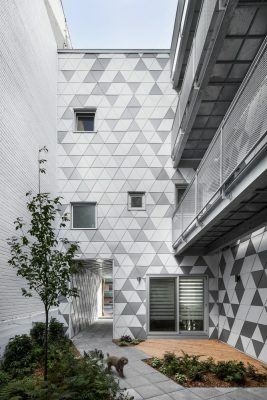 The inner courtyard reflects its crystalline and blazing materiality. As an architectural innovation, the project supports the creation of a new place, enhancing its integration within the context. 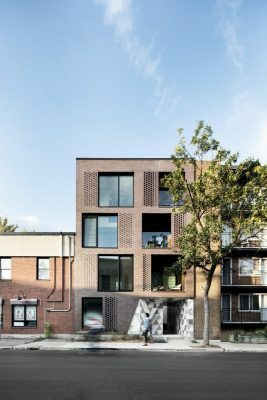 By preferring densification, the project acts as a linking point and the new typology created supports the urbanity of the neighbourhood. 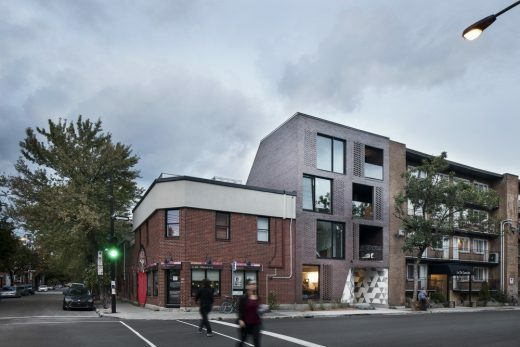 The ambition of creating an inner courtyard by using the space of the pre-existing alley induces a complete reversal of Montreal’s traditional typology characterized by dark dwellings of excessive length. Thanks to the central opening, the living spaces are bathed with natural light. 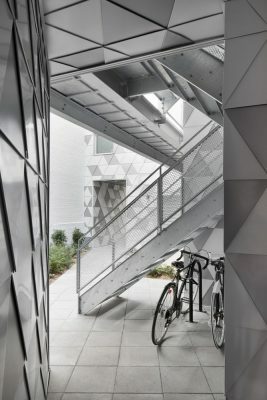 This new spatial organization eliminates the notion of the passageway, generating fluidity and optimized housing spaces. The mezzanine on the facade allows the light to penetrate the courtyard while harmonizing the height of the building with its neighbour. 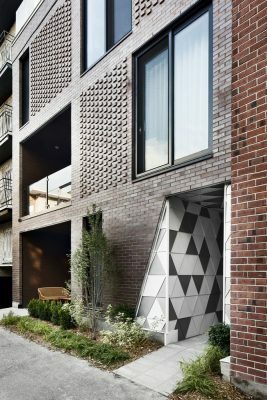 The exterior spaces in the front take form of private loggias that preserve the intimacy of the residents while participating to the animation of the street. In addition, the viability of the project depends on our ability to invest in the basement. 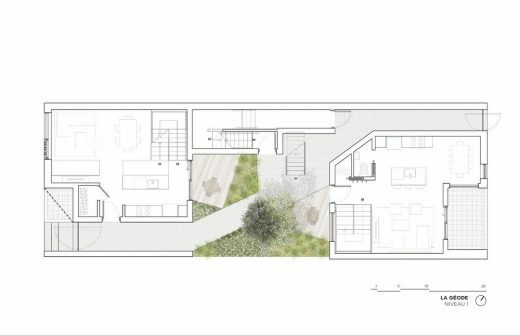 Coupled with the obligation to align the ground floor with neighbouring buildings, this constraint prompted us to rethink the basement from a qualitative point of view. 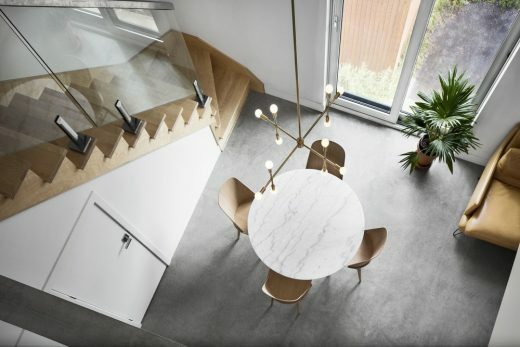 The space dug under the window well becomes a singular space channelling natural light to the rooms of the basement. 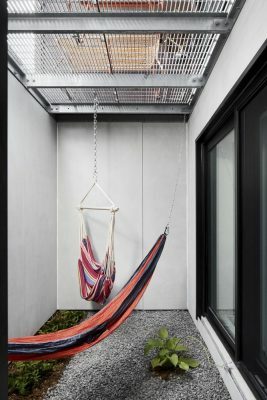 It also creates an external relaxation area with vegetation. 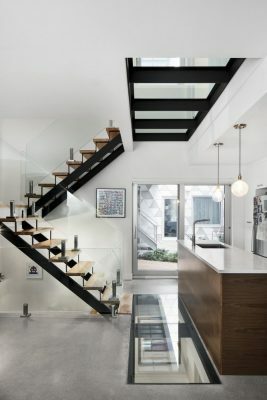 Furthermore, glass floors were installed between the ground floor and the basement to ensure maximum light distribution. The courtyard then became an urban oasis for the inhabitants. 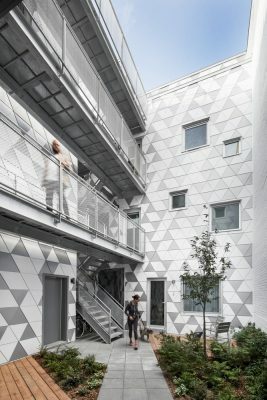 Finally, the exterior coating of this pleasant living space consists of shining triangular metallic tiles. 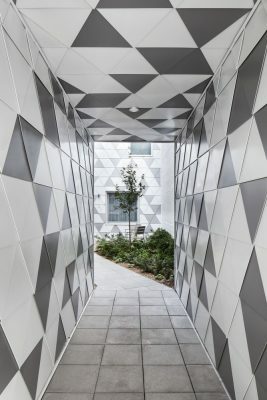 Their white and shimmering colours arranged towards the lower floors blend with the sky and propose a changing, sparkling and crystalline materiality. A green strategy and high energy performance support the project’s ambitions for innovation. 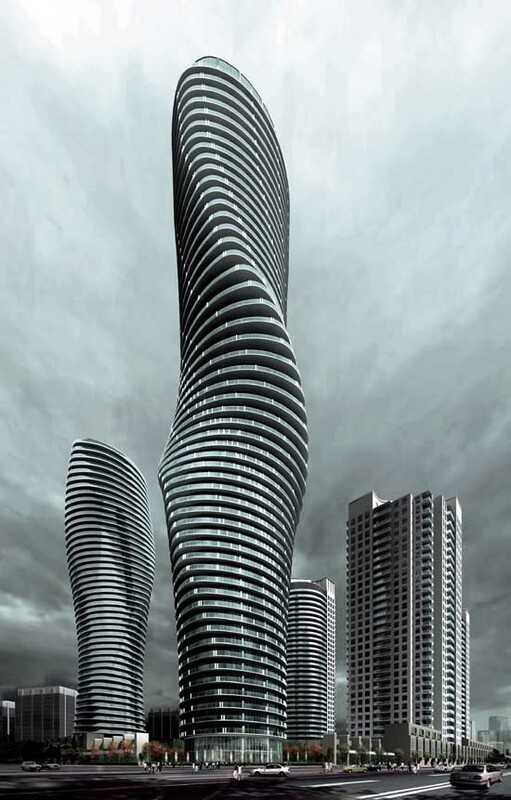 As a result, “La Géode” is expected to become the first multi-unit building to achieve LEED v4 certification in Canada. The inner courtyard allows abundant openings, guaranteeing maximum natural illumination as well as a cross ventilation of the dwellings. The use of energy-efficient materials and equipment is an essential part of the strategy put in place. In addition, the acoustic performance of the building exceeds good practice. The abundant presence of vegetation is also part of the green strategy put in place. 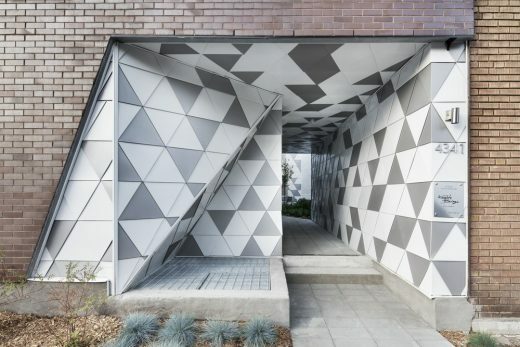 This construction evokes a mineral/vegetal coexistence that can be found in nature. 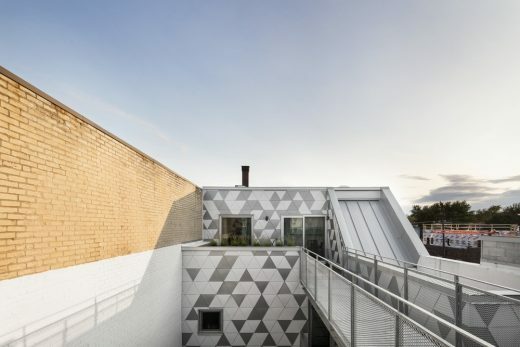 The inner courtyard, the spaces under the copings, the roof and all interstices become suitable surfaces for shrub, climbing species and tree planting. Thus, the vegetation conquers the floor and the walls of the inner courtyard, making it a peaceful haven.